A walkie-talkie is for many reasons a top device. Unlike calling a mobile phone, communicating with a radio does not cost money. In addition, radios have a battery life that you do not even come close to with a smartphone. Because they are super strong, they can be used anytime and anywhere. The user-friendly walkie-talkies on this page offer a solution in all kinds of situations, from long car trips to mountain hikes and from winter sports holidays to airsoft. At Frank you can buy a walkie-talkie from various top brands. For example, you can find your perfect Motorola radio with us. 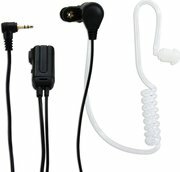 In addition, we also have all sorts of practical accessories, such as radio earphones and headsets. Because for many children a walkie-talkie toy is high on their wish list, you will also find various user-friendly children's walkie-talkies.